What happens when you have a city of 13.6 million people on one side and a city of 3.7 on the other? It means at least some of them are bound to be into cars, and some of those people are going to need a place to come and meet. 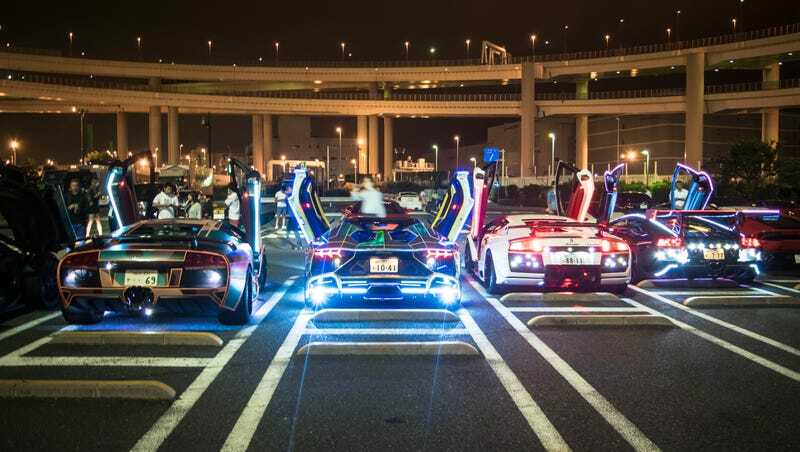 Luckily for them, there’s Daikoku Futo, quite possibly the most famous parking lot in Japan. Continuing on from the nightlife at Tatsumi, Daikoku Parking Area is also a motorway rest area that just happens to be a place of worship for Japanese car culture. Whereas Tatsumi is more popular with the Tokyo locals, attracting the more exotic stuff, Daikoku on any given night is even more of your Tokyo Drift fantasies come to life. If you like cars and you’re in Japan, a trip to here isn’t complete without a visit to Daikoku. It really should be considered a tourist attraction these days with the increasing number of foreigners visiting there. As a meeting area, it’s significantly bigger than Tatsumi. Here, car enthusiasts from Tokyo, Yokohama and elsewhere gather to show off their ride and to admire others. That’s like basically any meet, right? Well, Daikoku on a Friday or Saturday becomes uniquely Japanese. There’s still some variety at Daikoku. It’s not that the exotics stay exclusively at Tatsumi and the JDM stuff only go to Daikoku—there’s a lot of crossover between the two. It’s common for people to go from one parking area to another in the same night. Ideally, it’s best to start at Daikoku and finish at Tatsumi or spend one night at each one to get the full experience. Like Tatsumi, people have been meeting at Daikoku for years. I imagine it would’ve been particularly great during the 1990s boom and the Midnight Club era where it was common for people to race on the long stretch of motorway connecting Tokyo and Yokohama. Daikoku being right at the heart of it, it would’ve been a place to start, finish, and regroup. Nowadays though, the meets are slightly different. They’re a bit more casual and quite random. Contrary to stereotypes, Japan rarely does organized meets. Okay, you do get the occasional group or clubs organizing a get together but most of the time it’s just people going to Daikoku on a whim, maybe they’re bored that night or it’s good weather. What this means is usually you’ll never know what you’ll expect to see. One night you could see a McLaren P1, another night you could see a Nissan 370Z with a Porsche Panamera-style bodykit. The atmosphere at Daikoku is also a bit different from Tatsumi. It always feels livelier and more relaxed. At Tatsumi there isn’t much space to walk around, whereas at Daikoku you really do have to walk around because it’s so big. If you just stand at one place you’ll never know what’s showed up and what’s left. My advice to you would be to park up closer to the restaurant building at the end of the car park and just zig zag through the car park until you get to the exit and then make your back to the restaurant building. Just keep doing laps like that and you should be able to see most things there. If you like to see cars in action than stationary, the entrance ramp and the exit straight are the best places to stand by and wait. It’s sort of an unwritten rule for people leaving Daikoku to be generous with their right foot as they exit. If you’re lucky you’ll get a few launches too. Speaking of cars you’ll see, the photos here are only a small sample of what you can expect to find. There’s everything from the obscure, to the rare, and to the absolutely insane. There aren’t many places where you can see a mint-condition R32 Skyline GT-R at the same place as a Ferrari 360 with Swarovski headlights or a Nissan 350Z with 16 dolls on the bonnet. Sixteen. Dolls. Another common feature of Daikoku night meets are the “Sound Vans.” Not to be mistaken by the annoying noise polluting right-wing nationalists, the Daikoku sound vans are usually very ordinary looking vans decked out bright neons, laser beams, and with more speakers than seats. These guys park up together in a row and play everything from techno-electronic music to Ariana Grande. One day I hope they’ll play intense Eurobeat. These guys are loud. Why pay expensive entrance fees to clubs in Tokyo when you can rave with these guys at Daikoku for free? There are even some guys who rock up in their vans and just perform some dance moves to entertain the crowd. It’s all part of the fun at Daikoku and after a while you get used to the noise and bright lights. It’s kind of therapeutic. Daikoku is also a place where lots of tuners and shops show off their creations before or after an auto show. It’s like having an Auto Salon every weekend. The Pana-Z was SEMA and visits Daikoku often. The Tiffany Blue GT-R has been featured on a few magazine covers. The orange and silver Kaido Racer Datsun was the same one featured in the Red Bull video with Daniel Ricciardo and Max Verstappen. That’s what makes Daikoku such an important and integral part of Japanese car culture; it symbolizes the craziness, diversity, and unique originality that makes Japan such an interesting place to the rest of the world. The only limit to what one can do to a car is their imagination and from the country that gave the world the ‘Washlet’ toilet, Japan isn’t short of imagination. As a result there’s never a dull night at Daikoku unless you go there on say, a rainy Tuesday night. The large number of people that gather at Daikoku is a blessing and a curse. It’s great to see people coming out at the late hours of the weekend to share their love of cars with like minded people, but it does also have its own problems. More often than not the parking area becomes very full very quickly. This usually means the police have to come and kick a few people out as cars start parking on spaces designated for trucks and buses. It’s not like people have time to leave before the police come as well as there’s actually a police station inside Daikoku Futo. It’s getting particularly bad more recently as the police and the government are cracking down on illegally modified cars, so they perform on the spot checks of the cars at Daikoku too. These sorts of actions are counterproductive to maintaining Japanese car culture. It also does put people off going to Daikoku. But only for a couple of weeks or so. Then it’s business as usual again. To get there, a car is a must. Google Maps might say it’s possible to walk or taxi, but that’s not recommended. Things usually get exciting between 10pm to 1am so having car between these times is best. That way you don’t need to rush your time there and you can go home anytime. Should you stay for a couple of hours there’s no risk of dying from starvation or getting dehydrated. One of the advantages of Daikoku being a massive parking area, and one frequently visited by tourist buses and long-distance trucks, are the many facilities there. This might sound like a TripAdvisor review but Daikoku has about half a dozen or so restaurants to choose from, more vending machines than any parking area needs, and they’ve recently opened a convenient store too. If you think it’s crazy at night, wait until you see what happens during the day—but that’s a story for another time.